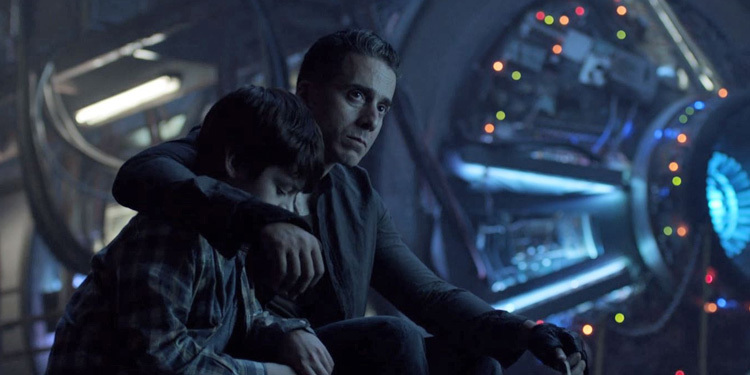 This week’s 12 Monkeys episode is a heartbreaking one as not only do we say goodbye to a character, but everyone’s world is turned upside down in the catastrophic events that happen in 2044. When the timeline was altered earlier this season, Jones found herself catching up with this new version of 2044 and discovered that her other self had a romantic relationship with Dr. Eckland. While she was completely flabbergasted by the situation, the mischievous scientist told her that he gets to woo her all over again and boy did he ever! We finally see the two lovers together in Jones’ quarters, him with his shirt partially undone and her in a robe. I’m sooooo happy for these two!!! Reeling from her kidnapping and subsequent encounter with the Witness, Cassie finally returns to 2044 but unknowingly brings a whole mess of trouble with her. She is still feeling the effects of the “full immersion” from the red forest tea and keeps seeing the Witness in the facility, making her question her own sanity. 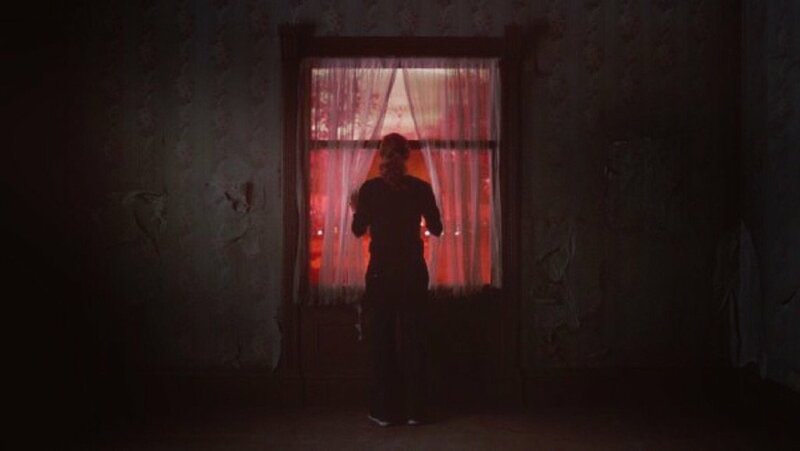 Cassie seems to hear Olivia’s voice talking her through the red forest and she follows it to the splinter room and there she sees the 12 Monkeys leader again (tinkering with the machine) before waking up in her chamber with no memory of how she got there. Jones though decides to check the time stream data of when Cassie was in 2016 to see if there are any anomalies that give credence to Dr. Railly’s claim that the Witness was physically in room 607 at the Emerson Hotel. But what they find is another tether that is anchored at the facility in 2044. 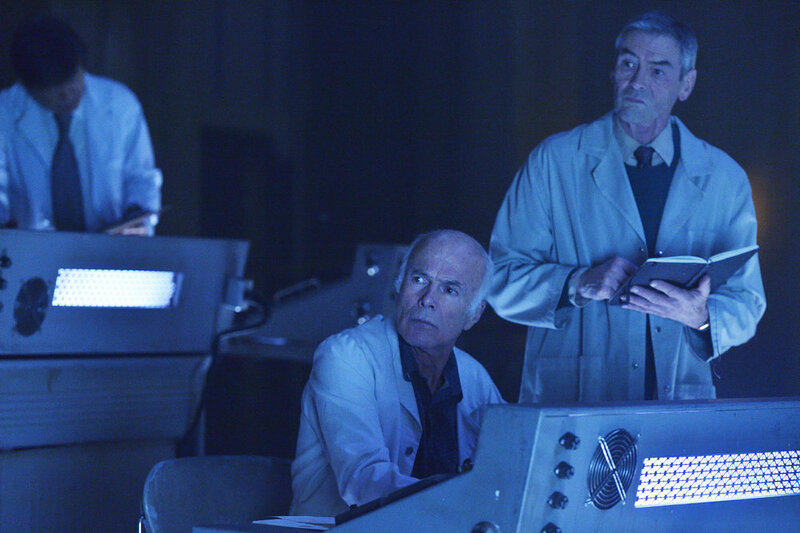 Jones tells Dr. Adler to recalibrate the machine and run another test but something goes terribly wrong. Everything goes haywire as the machine begins to overload splinter radiation because of too much power. They aren’t able to cut the power down from the console for some unknown reason and so someone has to do it manually from the core. If that doesn’t happen it’ll explode taking the base with it. Craziness ensues as earlier splinter volunteers appear totally disfigured having been lost in the time stream and anything hit by the radiation vanishing into the unknown. 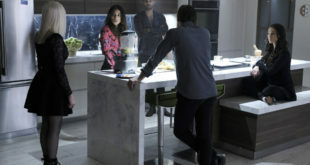 Deacon and Eckland decide to go get piece needed to fix the machine while Cole and Cassie head to the core to shut the power down and run into Ramse and Sam. We learn to little too late that it was Dr. Railly, being controlled by the Witness who had caused all of this. She ends up taking Sam to the core room and locking it to prevent the boys from entering and even sticks a gun to the poor kid. Once Eckland and Deacon come back from finding the spare part plus dealing with the poor soldiers from 1950 that accidentally got splintered to 2044, the scientist decides to do the most ridiculous, heart-wrenching, hair-pulling, declaration of love ever for Jones. After the splinter room is evacuated, Eckland goes in himself with Jones helpless to stop him. He says that there’s nothing like going out through a wild romantic gesture to a beautiful woman all in the name of love. In desperation Jones screams that she doesn’t love him so that he might come back inside but he counters that she did once and that can’t be erased. My heart is melting. Once he puts in the spare part, Eckland begins to dissolve with Jones unable to do anything but watch. This scene killed me, just when she had something good in her life it gets ripped from her. While the Witness has control of her body, Cassie is stuck inside the house within the red forest. Somehow the full immersion has allowed the leader of the 12 Monkeys to tether himself to the doctor and take over her consciousness. Through her he was able to sabotage the machine without Cassie remembering what was happening. However, while trapped she sees the Witness standing outside and behind him looms some kind of industrial city with the mysterious symbol (that we’ve seen on the necklace both Ramse and Olivia had as well as the neck tattoo on her) and the word “Titan” on the water tower. Cole is able to get inside the core room via a river access that is used to help cool the power source. Once he gets in, he tries to reach Cassie but the Witness is still firmly in control with the real Doctor Railly trapped in another plane of existence. In the physical world she then sticks a gun at Sam, preventing him from being able to do anything. Ramse soon follows though and points his gun at Cassie, ready to take her out to save his kid. Cole, caught in a terrible situation between the woman he loves and his best friend, realizes that the real Cassie wouldn’t let him die and so he tells Ramse to shoot him instead. Thankfully it works and a door in the house opens for the doctor, allowing her full control of her body once more. This poor kid really got a raw deal. He’s been telling his dad that his life is not worth everyone else’s, generally stayed out of people’s way in the facility, and is even extremely helping in helping Cole and Ramse get inside the core room but ultimately gets a bad deal. While the core gets shut down, there is a sudden surge of splinter radiation that sends Sam into the time stream. Where/when he ends up is unknown but someone wearing gloves (that looks suspiciously like the Witness’) offers a hand that he takes. Sam is a smart kid, he wouldn’t just go with some stranger so whoever this person is, it’s someone he already knows. After Sam’s disappearance, Ramse understandably decides to head out. He has a tense conversation with Jones and asks whether or not she thinks his son survived to which she responds unlikely, but he had been lost in time once and he’d found his way home. Unfortunately Ramse points out that Sam is just a boy. 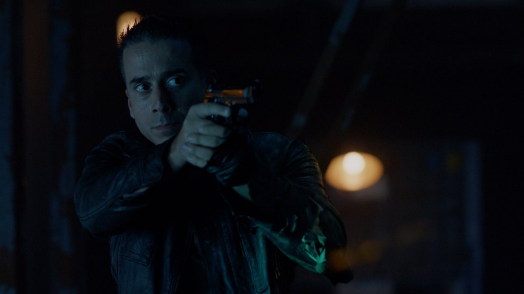 Both Kirk Acevedo and Barbara Sukowa gave amazing performances in this scene as two parents who’ve both lost their children. Jones feels the weight of her choices as she feels responsible for what happened to both Sam and Eckland. It looked like Sam was with Cassie (wearing a suit) when she was imagining she was in the red forest, how was he there? Ramse and Jones looking at each other after Sam disappears was so painful to watch considering she had just lost someone herself (Eckland). It’s like she’s completely given up. This was such an emotional and intense episode that left me reeling from the serious blow the Witness dealt Team Splinter. Though I wonder why the 12 Monkeys leader wanted to destroy the facility when he had needed it before. Could it mean that he no longer has any use for it because at least some of the Messengers have already been dispatched to cause the paradoxes? Season 2’s narrative continues to be sinfully good as the story unfolds into a much larger picture. While we now know the Witness’ goal is to destroy time to eliminate death, who’s death is he trying to prevent? After this episode, we’ve learned that he can tether into a mind via the red forest tea, though I do wonder if this would work with any person, or is there something special about Cassie? Also, where in time has Sam gone? All these new questions! 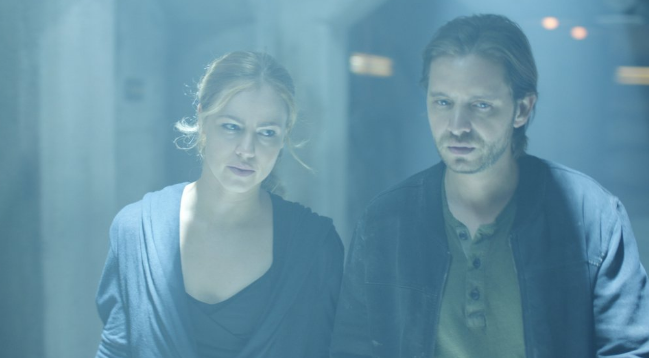 Just when we think things can’t get any crazier, 12 Monkeys pulls it off and then some. 12 Monkeys airs Mondays 9/8 central on Syfy. 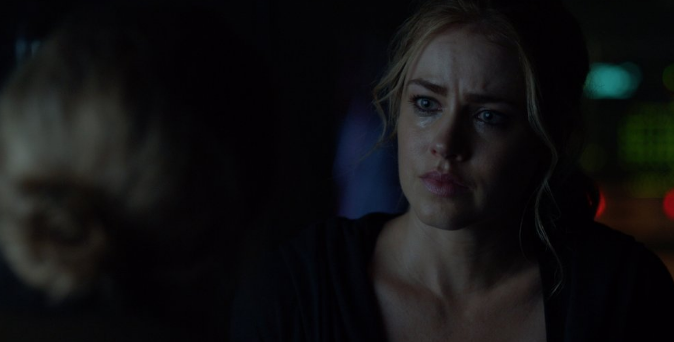 Catch up on all things 12 Monkeys here. Previous ‘Game of Thrones’ – “Blood of my Blood”: Reunions For Everyone! The scroll for the year, when they showed us “when” Sam went, looked like “1890” or even “1090.” But you could see that it was still in flux. I wouldn’t take Dr. Jones shots if I were Cassie. Her “fix” may be to eliminate the problem and this episode that was Cassie. She was never happy that Cole sent Cassie to her. Do tell! How will our minds be blown? I’ll put it this way. Next week is one of my favorite episodes of sci-fi television. I think the Witness is Sam, and he manufactured that situation to splinter himself. I take it Nicole is off sick because she would never delay her review of the best episode this season. Get well soon! Any more reviews coming? This is so exciting!